More than halved it – 2/3rds it! That will slow down as we focus on the emergency fund for now, and the car loan is 0% (better than USAA could do for us!). We’re at least not paying for the “privilege” of borrowing the money any more. Wow! You’ve made some serious progress in two years! My goodness. I came over from Rockstar Finance and you’re with good company. Congrats and keep up the good work. Selling our old house did a number on it because of the closing costs, but we look to be on a recovery trajectory and should “make” that back soon. Thanks for stopping by! I am very impressed with your net worth growth although I wonder what happened September 2014. Personal Capital tracks your investments and updates your net worth automatically. 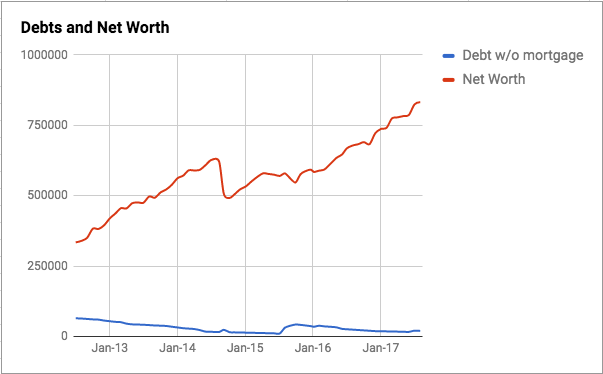 I use Personal Capital to track my net worth each month and it has worked pretty well for me. It does, but it also doesn’t link to some of my accounts and so is fairly inaccurate for me. I use it though.